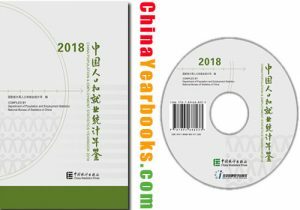 I．China Population and Employment Statistics Yearbook 2018 is an annual statistical publication, which contains data on basic condition of population and employment in 2017 as well as for the previous years for the whole nation and 31 provinces, autonomous regions and municipalities directly under the Central Government. It also includes the relevant data of some other countries and territories in the world. II．The yearbook is compiled by the Department of Population and Employment Statistics of the National Bureau of Statistics of China, and assisted by the Public Order Bureau of the Ministry of Public Security of the People’s Republic of China and the Department of Planning and Information of the National Health Commission of the People’s Republic of China. III．The yearbook contains the following eight chapters: 1.General Survey; 2.Data from 2017 Sample Survey on Population Changes; 3.Main Data from 2017 Labor Force Survey; 4. Data from Statistics on Employment in Urban Units in 2017; 5.Data from Household Registration in 2017; 6.Data from Family Planning Statistics in 2017; 7.Population and Employment Data of Selected Countries and Territories of the World; 8.Explanatory Notes on Main Statistical Indicators. IV．The reference time of 2017 Sample Survey on Population Changes was at zero hour on November 1 in 2017. The sample survey adopted multi-stage systematic PPES cluster sampling scheme，taking the whole nation as the population and each province, autonomous region or municipality as sub-population. A total of 1.15 million people were selected from 5035 survey districts in 4645 townships (towns or street committees) in 2194 counties (cities or districts) of the 31 provinces, autonomous regions and municipalities. The weighted estimation procedure suggested that the birth rate was 12.43 per thousand，the death rate was 7.11 per thousand and the natural growth rate was 5.32 per thousand for China in 2017. Based on these rates, it was further estimated that China had a total population of 1,390.08 million at the end of 2017, with 17.23 million births, 9.86 million deaths and a net increase of 7.37 million people during the year. Except table 2-1 and table 2-2, the rest of tabulations in Chapter Two were sample data. The sampling fraction for the nation was 0.824 per thousand. V．The population data of Chapter Two in the yearbook are from 2017 National Sample Survey on Population Changes, and those of Chapter Five are from the household registration, which use different definitions and data collection methods. Users should notice that the data under the same or similar heading in these two chapters may be different. VI．The national data in the yearbook do not include that of Hong Kong Special Administrative Region, Macao Special Administrative Region and Taiwan Province. (blank space) indicates that the figure is not large enough to be measured with the smallest unit in the table, or data are unknown or are not available; “#” indicates a major breakdown of the total. VIII．We welcome comments and suggestions from users with regard to deficiencies and mistakes in data editing and compilation. I．China Population and Employment Statistics Yearbook 2016 is an annual statistical publication, which contains data on basic condition of population and employment in 2015 as well as for the previous years for the whole nation and 31 provinces, autonomous regions and municipalities directly under the Central Government. It also includes the relevant data of some other countries and territories in the world. II．The yearbook is compiled by the Department of Population and Employment Statistics of the National Bureau of Statistics of China, and assisted by the Public Order Bureau of the Ministry of Public Security and the Department of Planning and Information of the National Health and Family Planning Commission of China. III．The yearbook contains the following eight chapters: 1.General Survey; 2. Data from 1% Population Sample Survey in 2015; 3. Main Data from Labor Force Survey in 2015; 4. Data from Statistics on Employment in Urban Units in 2015; 5.Data from Household Registration in 2015; 6.Data from Family Planning Statistics in 2015; 7.Population and Employment Data of Selected Countries and Territories of the World; 8.Explanatory Notes on Main Statistical Indicators. IV．The reference time of 1% Population Sample Survey was at zero hour on November 1 in 2015. The sample survey adopted two-stage systematic PPES cluster sampling scheme，taking the whole nation as the population and each prefecture-level city (prefecture or autonomous prefecture) as sub-population. A total of 21.31 million people were selected from 89147 survey districts in 85365 neighborhood committees (or village committees) in 33671 townships (towns or street committees) in 2977 counties (cities or districts) of the 31 provinces, autonomous regions and municipalities. The weighted estimation procedure suggested that the birth rate was 12.07 per thousand，the death rate was 7.11 per thousand and the natural growth rate was 4.96 per thousand for China in 2015. Based on these rates, it was further estimated that China had a total population of 1374.62 million at the end of 2015, with 16.55 million births, 9.75 million deaths and a net increase of 6.80 million people during the year. Except table 2-1 and table 2-2, the rest of tabulations in Chapter Two were sample data. The sampling fraction for the nation was 1.55 percent. V．The population data of Chapter Two in the yearbook are from 1% Population Sample Survey in 2015, and those of Chapter Five are from the household registration, which use different definitions and data collection methods. Users should notice that the data under the same or similar heading in these two chapters may be different.